Prisoner Points To Quran Search For Gitmo Hunger Strike : The Two-Way An Afghan captive provides the first sworn statement about what sparked a massive hunger strike at the American prison in Guantanamo Bay, Cuba. 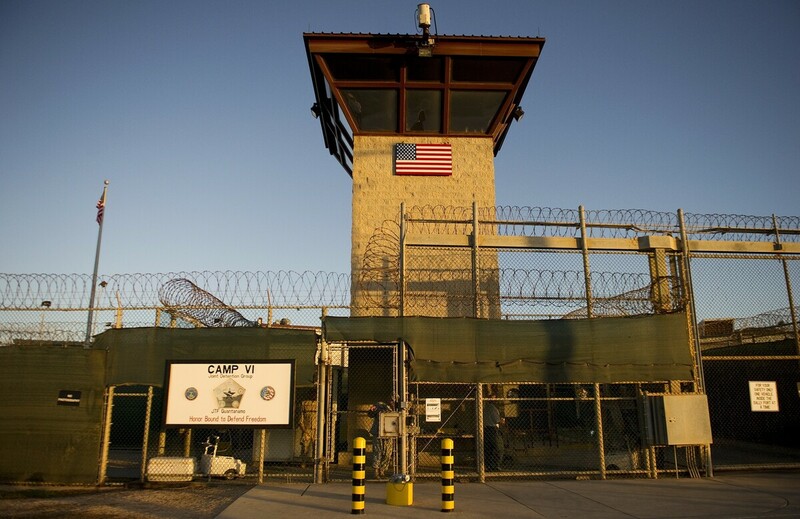 This image reviewed by the U.S. military shows the front gate of "Camp Six" detention facility of the Joint Detention Group at the US Naval Station in Guantanamo Bay, Cuba. The Miami Herald's Carol Rosenberg reports that for the first time, we have a sworn statement from a Guantanamo prisoner who talks about what sparked the massive hunger strike at the U.S. prison camp. During a February shakedown at Camp 6, writes the Afghan captive Obaidullah, "I and other detainees saw U.S. soldiers rifling through the pages of many Qurans and handling them roughly. This constitutes desecration. It has not been searched in five years." Rosenberg, who has been covering the prison at Guantanamo Bay, Cuba, since 2002, spoke to On Point today about the situation.